Prime Minister David Cameron has said he takes "absolute responsibility" for a shake-up of the NHS in England. He said Health Secretary Andrew Lansley was doing "an excellent job" but the government was considering "real changes" to the plans. Last week a nurses' union delivered an overwhelming vote of no confidence in Mr Lansley's management of the plans. The proposals would give control of much of the NHS budget to GPs and encourage private sector competition. The government says it is taking advantage of a natural "pause" in the progress of the Health and Social Care Bill through Parliament to hold a listening exercise with health care groups to improve the plans and build more support behind them. Mr Cameron denied this was a "PR exercise", adding: "We are looking at proper and substantive changes because we want to get this right." He told Sky's Murnaghan programme he had a personal commitment to the NHS and wanted it to succeed - but it had to be modernised and improved, owing to challenges such as an ageing population. He said there were some "key elements" to the reforms - making sure hospitals were more independent, keeping foundation trusts, paying by results, giving GPs a "lead role" in commissioning care, and getting politicians to "stand back" from the health service. But he added: "There will be some real changes, some real improvements." 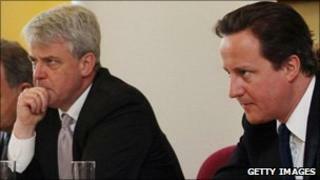 Asked if Mr Lansley's job was safe, the prime minister said he was "doing an excellent job". He added it was "much more important to get this right than to stick to your original timetable in every way". Mr Cameron acknowledged it was unusual to stop and discuss a government bill when it had already made substantial progress through Parliament - but said governments should not "plough on" if they could stop and got people "back on board". As Conservative leader, he had been involved in drawing up the blueprint for the NHS for some time, he said: "I've been involved in designing these changes way back into opposition with Andrew Lansley. I take absolute responsibility with him for all of the changes we are making." But Labour's elections co-ordinator Andy Burnham told Sky it was Labour who had "forced the government into this pause" on the NHS plans - and said the government had no mandate for the changes. The former health secretary said: "I happen to believe [the listening exercise] is a PR stunt... We gave voice to people's concerns around the country - the concerns of nurses, of doctors. "It falls to us to be people's voice in these challenging times." Critics of the plans, including the Royal College of Nursing which delivered last week's no confidence vote, have warned the changes could undermine the NHS. Lib Dem activists have also aired their concerns, voting against the restructuring at their spring conference. Lib Dem MP Norman Lamb has said the pace of changes is "very risky" and warned that he could quit as Nick Clegg's aide if some changes are not made. Labour leader Ed Miliband has said the plans should be "junked", arguing that the more people heard about them, the less they liked them.